Natural Building includes a variety of building techniques that focus on creating sustainable buildings which minimize their negative ecological impact. Natural Buildings often rely on non-industrial, minimally processed, locally available, and renewable materials and can also utilize recycled or salvaged materials. Natural Building ideally incorporates sustainable design practices to integrate the building into its environment. It may also integrate electricity production, water catchment, passive heating and cooling, and alternative waste-treatment. Want to learn how? Participate in a Dancing Rabbit internship or work-exchange opportunity! Building homes and other structures that are healthy for humans and for the planet is an essential part of sustainability. At Dancing Rabbit we strive towards these ideals as we try to build homes that are functional, aesthetically pleasing, and long-lived. Our idea is to construct shelter that integrates into, and minimizes its ecological impacts on, our land. Shelter that requires the least input, and whose outflows are absorbed by active management of the surrounding landscape. Of course our homes are not all perfect manifestations of this natural building ideal. Many of our buildings still use some industrial components such as concrete, drywall, steel roofing, foam insulation, and vapor barriers in construction. We are still learning to integrate our homes into the surrounding environment, and in design we think long on trade-offs between footprint and functionality, cost and comfort. Some of our builders are re-forging a construction aesthetic that eschews use of these less sustainable materials. There are as many Natural Building technologies in the world as there are climates and bioregions—appropriate materials and technique are largely dictated by the climate and available natural resources of the place the building will stand. Most rely on a handfull of elemental materials: earth (clay), wood, stone, sand,and straw (where straw can be loosely defined to include any dried non-woody plant material such as palm fronds, reeds, etc.). Based on the climate the building must coexist with, these materials can be combined in any number of ways to produce a natural structure. At DR we have ready access to many natural building materials. We are lucky to have an abundance of clay (though the gardeners may differ on this point), which is a basic ingredient for many natural building techniques. Straw bales are seasonally available from our farming neighbors, but construction-quality wood is in shorter supply in our prairie-savannah ecosystem. Our woodlands are mostly oak and hickory, and we have used some native lumber, but our primary source of building wood is salvage. Before building something new we must often engage in deconstructing something old and no longer wanted. Given the Midwest’s still-declining rural population, such structures are often available. Timber Framing – Timber framing is an old natural building technology which uses heavy timbers and joins them using mortise and tenon joints pegged with wood dowels, rather than smaller dimensional lumber and nails or screws. The open bays of a timber frame wall can then be filled in with straw bale, light-clay straw, cob, or any number of other materials. Post and Beam Framing – similar to timber framing in using larger timbers to carry roof and wall weight over wider spaces, but relies on steel hardware joinery, more accessible to the amateur builder. 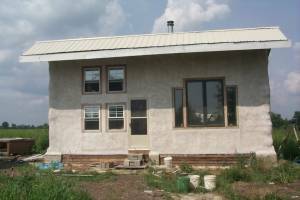 Strawbale – Straw bales can be stacked like bricks to make the walls of a house. We have built both load-bearing (roof supported by the bales) and non-load-bearing straw homes. Cob – Cob is a mixture of sand, clay, and straw similar to adobe, but lumps of cob are applied wet to build up a wall, bench, or as thermal mass around stoves. Like sculpting a home. Light-Clay Straw – Also called slip straw, clay is mixed with water to the consistency of paint, and then is mixed with loose straw until every straw fiber is coated. The Straw-clay is then packed into forms or wall cavities for insulation. Once dry, dense clay-straw can be directly plastered with earth or lime plasters. Earth bag – Sand or gravel mixed hardened with clay can also be packed into polypropylene or burlap feed bags that are stacked to build a high-mass wall. The wall is plastered to protect the bags from UV degradation. Lends itself to sinuous wall shapes and/or buttressing. While burlap bags are harder to come by, and the plastic ones not very natural, the embodied energy of the polypro bags is low when considered as a durable part of a house. Living Roof – A living roof relies on soil as a sheltering mass and insulation from the elements, allowing plants to grow on top of a roof (either tended like a garden or left wild). Soil is built up over a waterproof membrane on an extra-sturdy roof. The soil and plants can help keep a building cool in summer and warm in winter using the natural effects of evapo-transpiration and thermal mass. Bonus: goats, sheep, chickens, and rabbits can nibble on your roof! Wattle and Daub – Wattles are made from flexible wood or fibers and are woven loosely to create an underlying structure for a wall (imagine a loosely woven basket). Plaster is then daubed onto the wattle to finish the wall and provide thermal mass. Straw wattle is a better-insulated variation where clay-embedded long straw fibers are woven around light-weight uprights and then plastered. Natural Earth Plaster and Lime Plaster – Most of the above techniques are finished off with a natural plaster. Earthen plaster is made from clay, sand, and straw (and sometimes other fibers and materials such as cattail fluff, manure, and wheat paste). Lime plaster is made with sand, hydrated lime, and sometimes fiber (straw, animal hair, etc.). Lime is made by heating limestone in a kiln and has been used since ancient times, though we generally use industrially-produced bagged lime. Lime plaster has a much higher embodied energy than earthen, and requires more caution in installation owing to its caustic nature, but is much more weatherproof than earth plaster and has less embodied energy than cement stucco. Rubble Trench, Urbanite, Gravel Bags, and Frost Protected Foundations – One of the trickiest and most laborious parts of natural building is the foundation. We have employed a few techniques to minimize the amount of concrete used in our buildings, including foam blocks, stones, and other balast (concrete has high embodied energy and produces greenhouse gases in its production). The rubble trench is a lower-embodied-energy alternative which primarily employs local limestone gravel, tamped well as the trench is filled, to support the weight of a house above. Perforated drain tubing buried in the gravel at the base of the trench drains surplus soil moisture away from the structure to avoid frost heave. By lining the trench with 2” styrofoam insulation, the trench can be limited to two foot of depth (where our local frost line is officially four feet—this is the “Frost-protected shallow foundation’), relying on the heat radiating into the ground from the house above, and the foundation insulation to hold it in, to avoid the need for more depth. For protection against rats and other unwanted tunnelers, we may also include metal skirting to line the trench. To build the foundation above-ground, we have used Urbanite (reclaimed busted concrete hunks, pieced together and mortared in place), gravel bags (polypropylene bags filled with gravel, stacked brick-style), and poured concrete or block stem walls (often using insulated forms). Other buildings at Dancing Rabbit sit on concrete piers, a style which economizes on the material and labor input of the in-ground foundation. One gives up a connection to the earth as a thermal mass, but with a well-insulated floor, the structure can still be made energy-efficient. Earth Floors – Also called adobe floors, an earthen floor is made from the same material as cob or earth plaster and is troweled to a smooth finish. Once dry, it is oiled with multiple coats of linseed oil, which hardens it against wear and even leaves it mop-able. Adobe – Adobe, like cob, is made from straw, clay, and sand but is sun dried into bricks and then stacked to form walls. It is generally finished with an earth plaster. Rammed Earth – Earth can be pounded into forms to create massive walls to form a house. While utilizing minimal resources, it can be very labor intensive. Earthships – Earthships are a method of rammed earth where earth is rammed into used tires that are stacked to form walls. We have used this technique for a retaining wall on an earth-bermed house. Thatch – Thatch is used throughout the world for walls and roofs. We have experimented just a bit with using native prairie grasses for thatching, but have room for lots more testing. At Dancing Rabbit we also use more mainstream ecological building techniques such as stick framing (from reclaimed and local lumber), blown-in cellulose (both wet and dry), drywall, and wood siding (salvaged from old barns). We have even salvaged an old Grain Bin that sat on our property when we bought it, and turned it into a two-apartment straw bale building. Some foundations are concrete, and include concrete block walls (for cisterns and earth berming). Most of our roofs are steel, which is ideal for water catchment systems. We see Dancing Rabbit as a place for learning about natural building. Work Exchangers can get hands-on experience with the various technologies, and we hope to have more natural building workshops in the future. We also encourage those with natural building skills and aspirations to come join us. We’d love for you to build your natural home here at DR, and share your skills with us as we share ours with you. In addition, we have many paid work opportunities for those with building skills from those in the village who want help building a home. Skyhouse: A 6 bedroom communal house for Skyhouse Community. A Strawbale Cabin: A photo essay from 1998 of the wall raising of our first building. Grain Bin: The 40-year-old grain bin on the property has been renovated into living space! And a Roof Over Our Heads – An article by Aaron Corbin from 1997 on living roof design. Earth and Sky – An article from 1999 by Tony Sirna on Skyhouse construction plans. 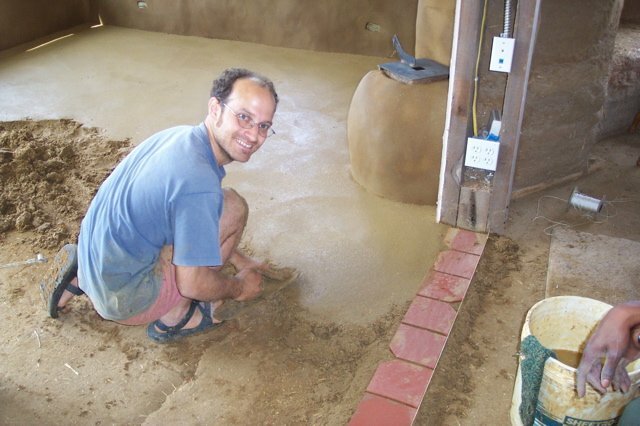 Earth Floors – An article by Tony Sirna from our summer ’01 newsletter on an adobe floor / rammed earth floor. A Roof over Our Heads – An interview from 2006 by Juan Borla of Tamar Friedner on the subject of Ironweed‘s roof and insulation system. Natural earth plaster how-to – A step-by-step guide to finish plaster, by former Ironweed wexer Travis Toon. Organizations involved in teaching and promoting natural building.